With no shortage of high-power R/C monster trucks to choose from, ARRMA has thrown another option into the mix with their Big Rock Crew Cab 4×4. This 1/10-scale, brushless monster truck could be considered the smaller cousin to the 1/8-scale Nero Big Rock, but the slightly smaller size doesn’t mean less powerful. No, the Big Rock Crew Cab 4×4 appears to be doing just fine in the power department, thanks to its BLX 3660 3300kv motor and 3S LiPo-capable ESC. Known for durability, ARRMA has married this power to a tub-style chassis which is designed to withstand wicked impacts and obstacles. Another design feature, unobstructed access to components such as front and rear diffs, electronics, and driveline, should make upgrades and repairs quite easy. Outside of the internals, the Big Rock Crew Cab also carries some impressive visual features. As the name implies, the body style of this truck mimics that of a crew cab pickup. An aggressive grille, flared fenders, and detailed front and rear bumpers set the tone for this rig, which looks as menacing as it can be with its blue paint job. An included 2.4GHz Tactic TTX300 3-channel transmitter provides long-range control and waterproof electronics (steering servo, ESC, receiver box) allow you to drive and bash just about anywhere you please. 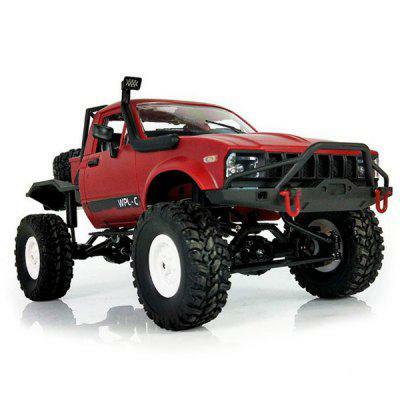 Priced at $319.99, the ARRMA Big Rock Crew Cab 4×4 will be available for purchase online and through ARRMA dealers. Visit arrma-rc.com to learn more about this monster truck model.